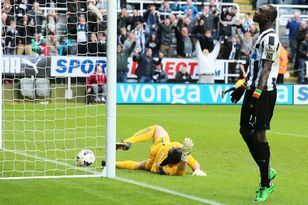 DEMBA BA never wasted a second worrying why his goals had dried up for Newcastle United. Although he spent a lot of time studying the reason why he had lost his scoring touch. Ba looked a relieved man when he brilliantly beat Tottenham goalkeeper Brad Friedel to open the scoring in Saturday’s 2-1 win. While the Senegalese will claim it didn’t bother him, that’s not to say the striker wasn’t ready to do something about. Ba said: “It was a good goal and I am very happy we won. It was a good opening day for us. “I was okay going so long without scoring. Just ask the other players. “They will tell you that I am not just looking for goals even though it is a good feeling when you do score. “You just have to carry on doing your work and it will come back. Ba added: “A lot of things were going on last season. I was playing on the side and out wide. “I was not frustrated because I did not score but because I did not get enough of the ball. NEWCASTLE United want to sign another senior striker before the transfer window closes on Friday – and have drawn up a list of Continental alternatives to their priority target Andy Carroll. SAMMY Ameobi is using his big brother to inspire him to European glory with Newcastle United. A trophy or a good league position for Newcastle?